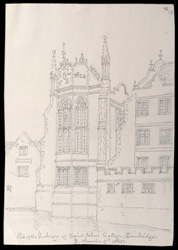 When St John's College was opened in 1516 the original library was located in the First Court or Quadrangle. In the 1620s the College acquired collections from William Crashaw and Henry Wriothesley, devoted bibliophiles and alumni of St John's. The old library was now too small and the college needed to find patrons who would fund the building of a new library. Valentine Carey, Bishop of Exeter and John Williams, Lord-Keeper and Bishop of Lincoln, agreed to fund the venture and the new library was built between 1623 and 1628. The building is in the Jacobean Gothic style and measures 110 ft long and 30 ft wide. The 42 original bookcases were crafted form the very best oak and exquisitely carved, and so too were the fixtures and ceiling. Over the years, the library continued to grow and alterations and additions were made to the 17th century building.